Doctor Who Magazine scales new heights in Issue #422! Steven Moffat tells us exclusively what happened when he joined Matt Smith and Karen Gillan to promote the new series in the Big Apple – and what ‘whisking’, giraffes and babies have to do with the world of Doctor Who – in the latest Production Notes! Lush jungles and cascading falls! DWM visits Croatia and goes behind the scenes of The Vampires of Venice, with exclusive interviews with Matt Smith, Karen Gillan, Arthur Darvill (Rory) and Helen McCrory (Rosanna), executive producer Beth Willis and producer Tracie Simpson! Deep, dark caves and the bottom of the sea! Enter a world of Cave-Monsters, Sea Devils and savage dinosaurs as the Watcher tells you everything you need to know (and discovers quite a few surprises!) about homo reptilia – the Silurians! All the latest official news, reviews, previews, competitions and much, much more! 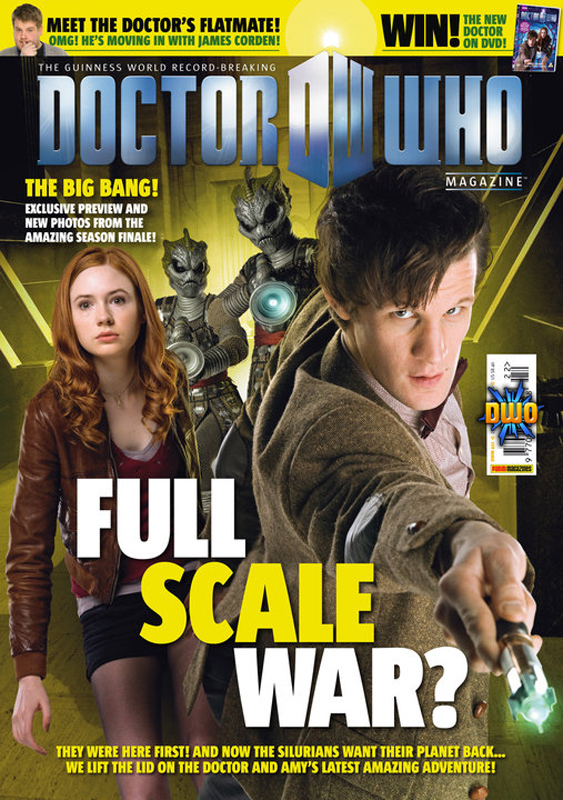 Doctor Who Magazine Issue #422, is on sale from Thursday 27th May 2010, priced £4.20.